"New Sheriff In Town" Includes FREE personalization! 1 in stock now! 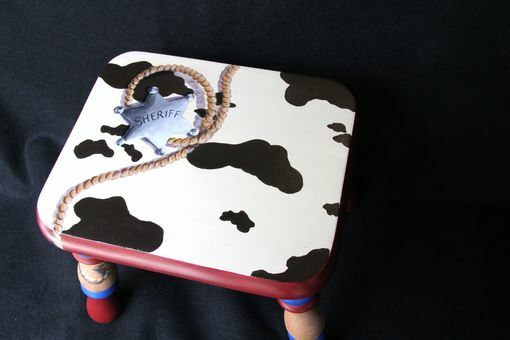 This sturdy, solid hardwood footstool can be hand painted just for the little cowboy in your life! The vibrant color scheme of barn red and denim blue are accented with a cowhide pattern in antique white and dark brown--cowhide is an absolute must in cowboy decorating! 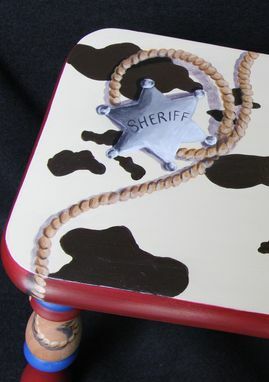 The little cowpoke left a few things behind after his last ride into the sunset--a trompe l'oeil ("fool the eye") sheriff's badge and a rope, which curls and dangles over the edges of the stool. 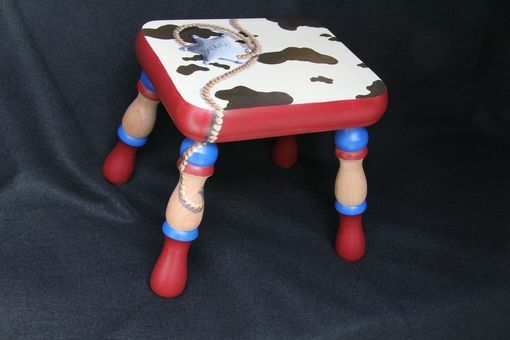 This stool will give your little one a leg up for years to come! Upon purchase, your child's first name can be hand lettered onto the front edge of the stool at no extra charge! 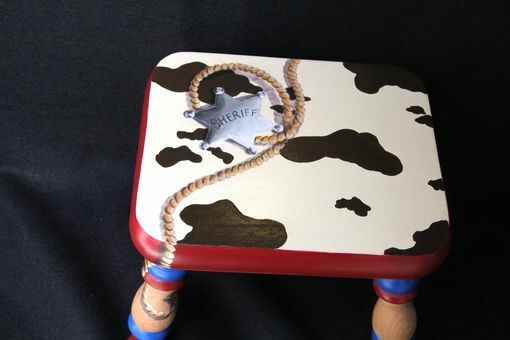 Simply message me with the name you would like, and I will hand paint it in high Western style. 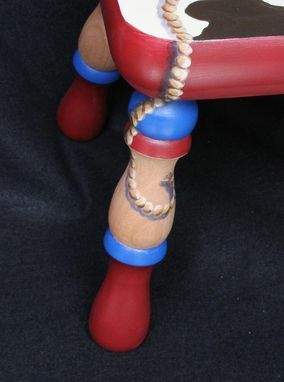 This piece is made to order, and customizations are welcome (additional fees may apply if customizations exceed the scope of the original design). Contact me about elements and colors that would make this piece meaningful to YOUR child, and let's see what useable art we can create just for you! The entire stool will have multiple coats of non-toxic exterior grade sealer, so clean up is as easy as a wipe with a damp cloth. Dimensions are 13 5/8" (width), 10 5/8" (height), 11 5/8" (depth). Made by Whittier Wood out of solid alder wood. Each piece is signed and numbered for authenticity.